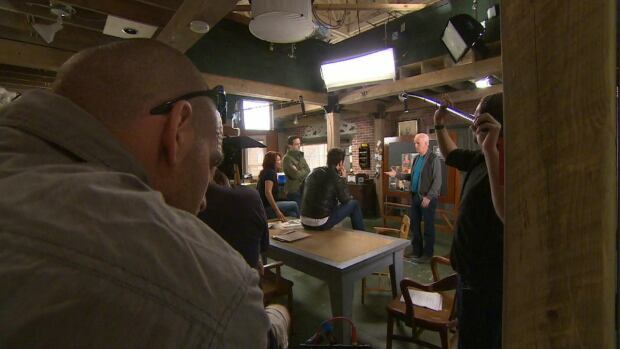 Last days of Republic of Doyle. Click picture for video link. The tires on Jake Doyle’s GTO will screech for the last time on Wednesday, as shooting for the final season of the hit series Republic of Doyle will come to an end. The Gemini-nominated show debuted in January 2010, and on Oct. 15, the sixth season will premiere on CBC Television. Republic of Doyle star and co-creator Allan Hawco, who has played Doyle, took a few minutes from taping on the southside of St. John’s on Tuesday, to speak with the CBC’s Zach Goudie. Hawco said there’s been a large level of nostalgia as the crew wraps up the show. “And, a certain level of an emotional connection to this family of people that we’ve been working with for six years. Being able to work and live in my favourite city in the world, with my favourite people, it’s going to be a hard separation. I think it’s going to be emotional for everybody and I’m not looking forward to that,” Hawco said. ​Hawco said it was a hard decision to have season six as the final instalment of the show. “Well, you’ve got to think all the jobs that are in play, the amount of marriages, babies that have been born, houses that have been bought. This is people’s livelihood,” said Hawco. Unlike seeing show regular characters Jake, Des, Tinny, Rose, Malachy and Leslie on-screen, there is an army of support — 150 people who work full-time — behind the scenes. The St. John’s Morning Show spoke to several of the folks who work on every episode. Gina-Rae Anderson, who has worked in the props department, was studying film in Halifax four years ago. “I just knew that when I came back to Newfoundland that I just couldn’t see myself doing anything else but working on the show, and somehow it all worked out. And now I’m doing my dream job,” Anderson said. Jess Anderson is the digital unit manager with the show, and prior to working on Republic of Doyle, didn’t have any television experience. “Over the past four years, I think I’ve learned a lot. We’re here for about 12 hours a day, so you get to see kind of everything from you know, how the cameras work, to who does what in the crew. And then where I’m working around, I get to see the show come full circle with editing and post and see how it’s all done,” Anderson said. Hawco said while it was a tough decision to end the series, it was the right one. “Because, every year we were at the hands of fate. We just didn’t know if we were going to be ordered every year, and we wanted to make sure we had control over how we went out,” said Hawco. After Wednesday’s wrap, the crew will conclude editing and post-production.